With the weather cooling and rain threatening, we’ve been in a frenzy of preserving lately! The peppers did especially well this year, thanks at least in part to the sun-shades we made by attaching empty chicken-feed sacks to the wire cages with clothespins. We usually lose half the fruits to sun scald, so it’s especially satisfying to have found a solution. 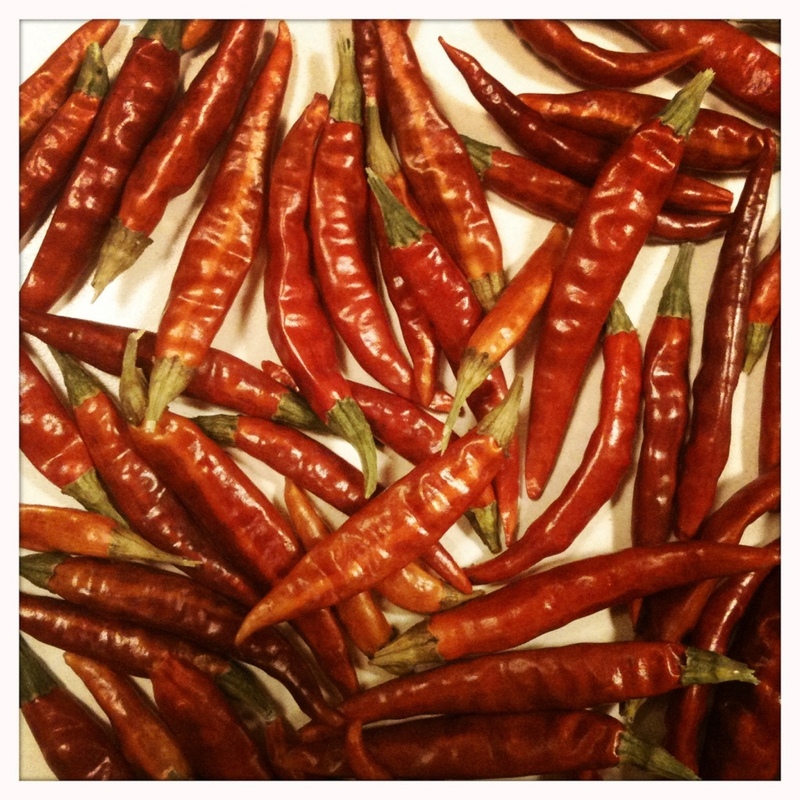 Of course, the flip side is that we have twice as many peppers and chilies to deal with! Last year I made some scrumptious pickled roasted peppers, and we put up pints and pints of pickled jalapeños, but with so much to do before the weather turns, we’re turning to speedy, simple methods this year to preserve everything in sight. I thought I should crawl out from under my heap of peppers for a few minutes to share some of my favourites! 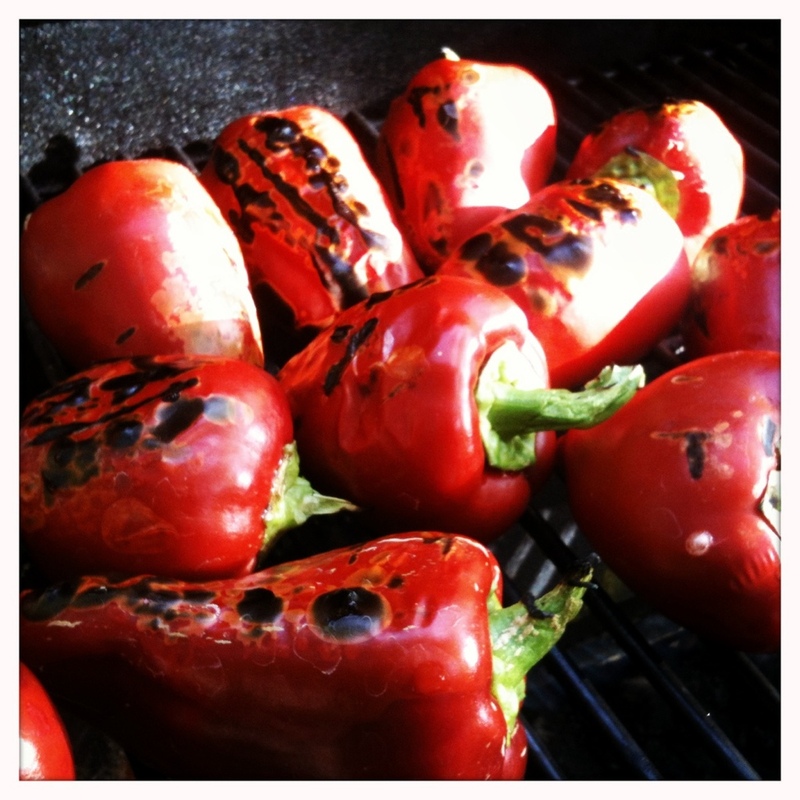 To freeze, spread peppers on foil-lined baking pans and place in the freezer. When they are completely frozen, transfer to zip-top freezer bags or containers. (This keeps the peppers from freezing into a solid block, as the tend to if you just toss them straight into the freezer bags without individually-freezing first.) Label everything right away — pepper varieties may look totally different fresh, but its often near-impossible to tell the anchos from the pimientos when they’re all black frozen blobs! To use, thaw the peppers, peel off the skin (running them under warm water makes this a snap), and remove the seeds. 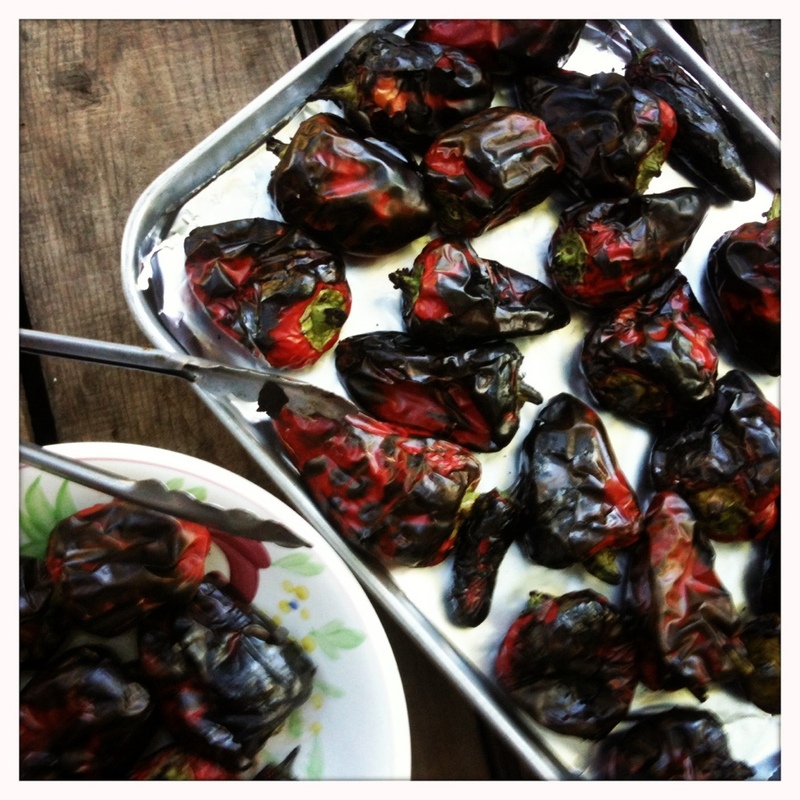 Pimientos are divine when roasted — their firm flesh is ideal — but poblanos and even jalapeños are also excellent. We made smoked roasted jalapeños by wrapping apple twigs loosely in foil and placing on the grill directly over the flame — when the twigs start to smoke, add your jalapeños and close the lid. Check and turn them often, though, as small peppers can burn quickly. This method gives them just a hint of extra smokiness, and they make fantastic salsa, especially when combined with tomatoes roasted the same way! Just peel the chilies and tomatoes, add a bit of chopped onion and a pinch of salt, and whiz in a food processor until blended. Transfer the paste to glass jars and store in the refrigerator or freezer. And here’s the cool thing: refrigeration actually tames the heat of the paste, allowing the flavours to “bloom” and to stand out over the searing heat of the fresh chilies. The paste keeps up to a year refrigerated, longer frozen; try a spoonful in curries, chili, you name it! The easiest of all, especially if you have a dehydrator or a sunny day outside! Thai chilies and other small, thin-walled peppers are best for this. 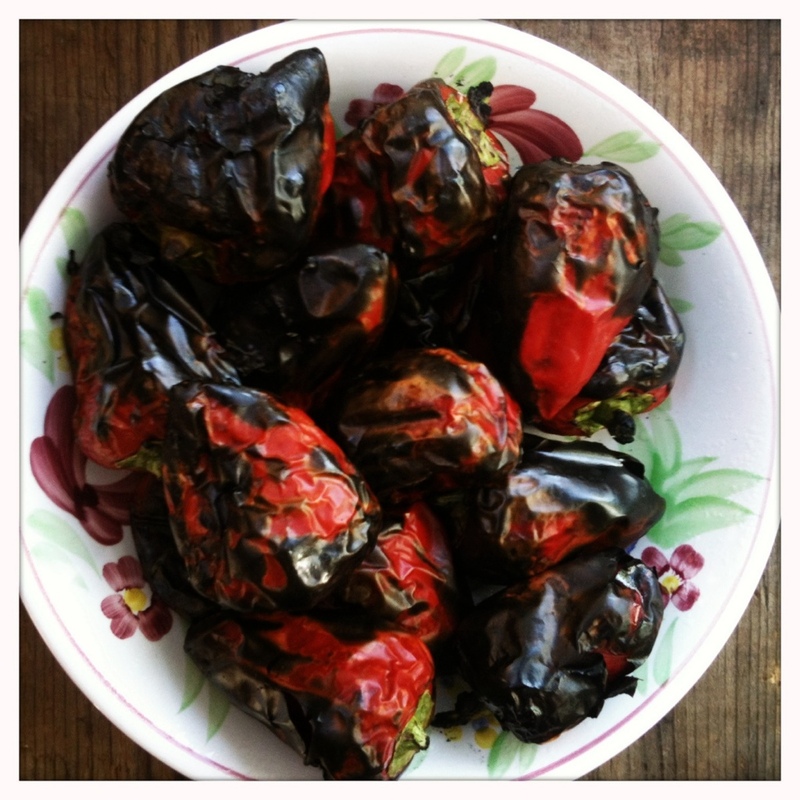 (Avoid whole thick-walled peppers like Bell, Pimiento, or Jalapeño peppers; they can spoil before they dry completely.) Anchos are another great drying pepper — pick ripe, glossy-red fruits, and make a slit down one side if you want them to dry a little faster. 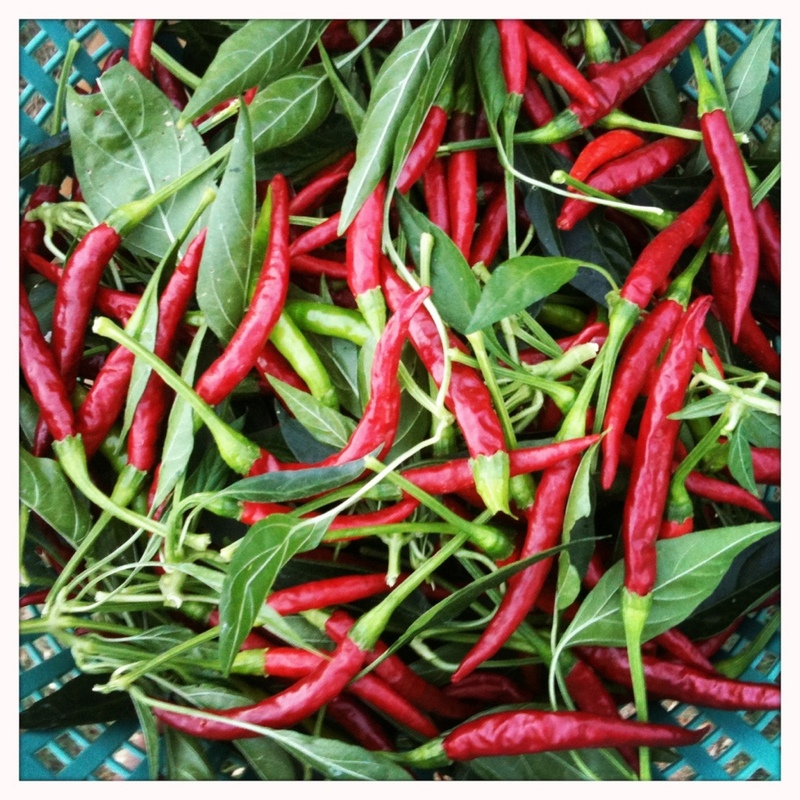 You can also string chilies with a needle and thread (through the stems) and hang them by the fire or in another warm spot. Well, that’s enough to keep me busy for a few days — and enough chilies in their many forms to keep us warm all winter long! Autumn is here at last — there’s a lingering chill in the air, even on the sunniest days, and the soil is cold and damp. Time to plant fava beans and garlic, onions and cover crops, before it gets too cold for the little seeds to sprout. 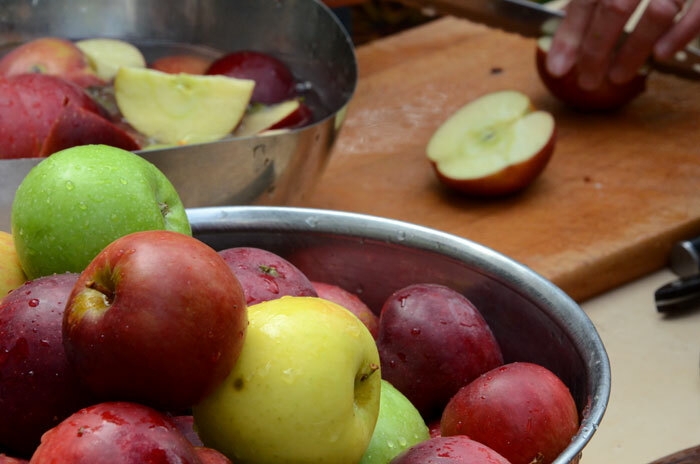 But first, it’s time for something that seems to be becoming a fall tradition for us: apple-cider making! 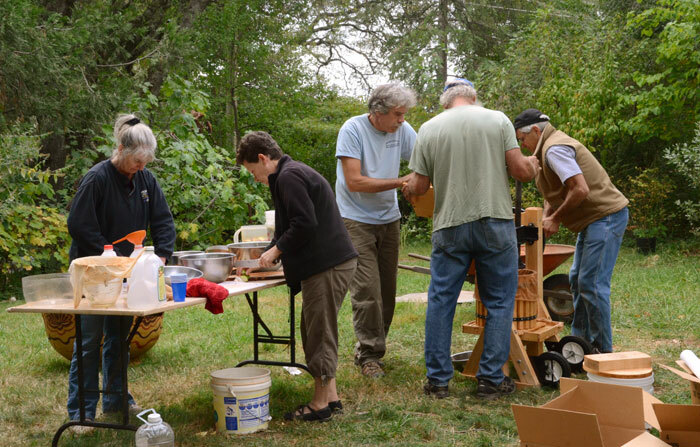 Cider-making is one of those things that are best done with company; we team up with our friends Paula and Eric, who have a beautiful little cider press. 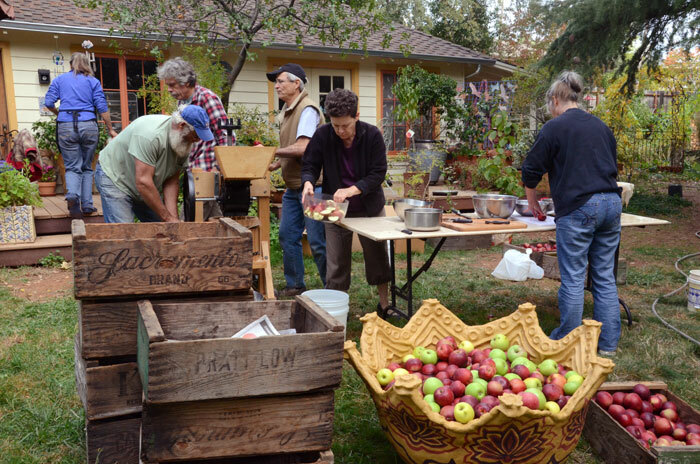 Last weekend we hauled 400 pounds of apples over to their backyard, where we spent a lovely morning chopping and crushing and pressing apples… and of course talking and cider-tasting and swapping mushroom-hunting and mead-making tips. 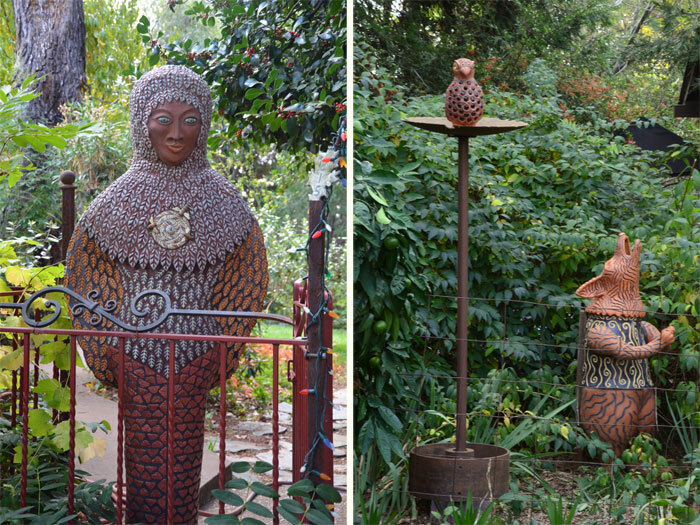 Paula and Eric’s yard is completely entrancing, with their handmade ceramic sculptures tucked among the trees and bushes. 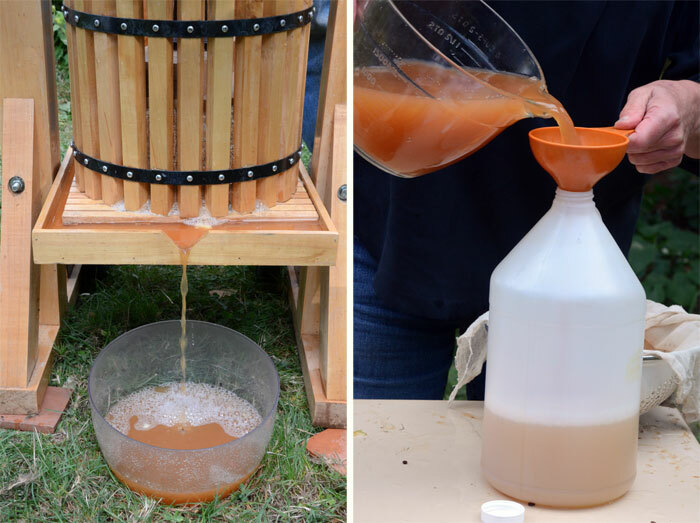 Pressing apple juice isn’t complicated, but it does take work! Friends Donna and Tom join us to help as well. 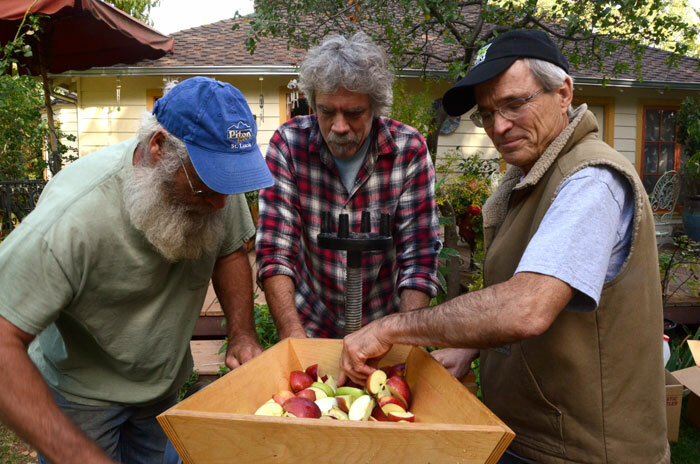 We start by chopping the apples into quarters, so they run easily through the hand-cranked crusher. 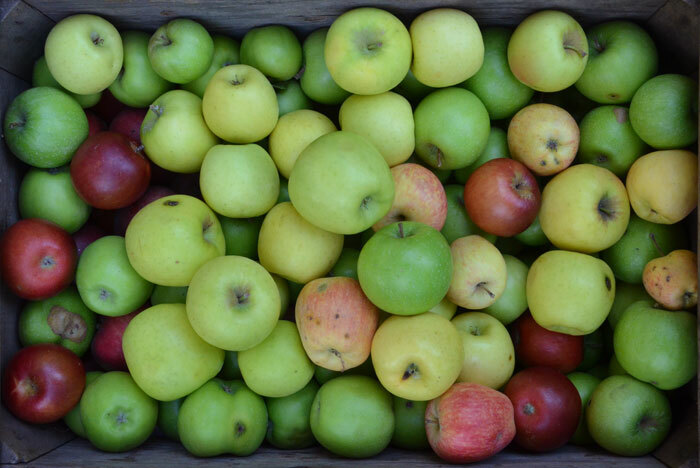 Sounds easy enough… until you calculate that there are several thousand apples sitting there in those lug boxes. And that’s just step one! A mixture of Black Arkansas, Green Scrumptious, John’s Delicious, and Granny Smith apples gives a well-balanced juice, both sweet and tart. Next, we dunk the apple chunks in a bath of citric acid and water to keep them from browning. 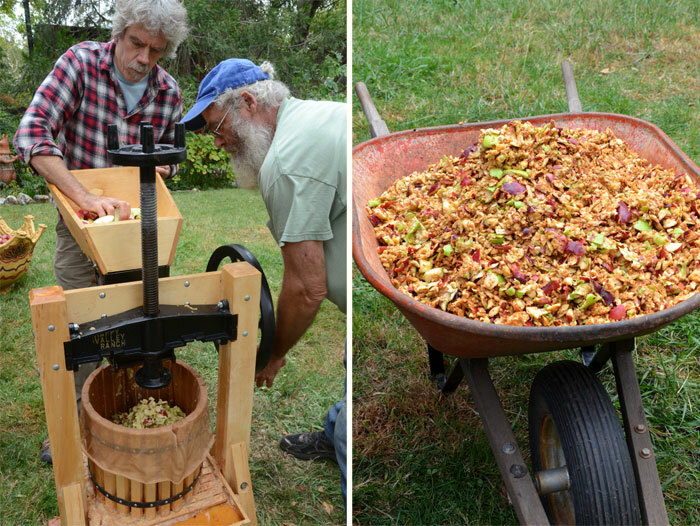 The apple chunks then go into the hopper, where they head down the chute to the hand-cranked crusher. They’ll emerge at the bottom as a coarsely-ground mash, ready for pressing. 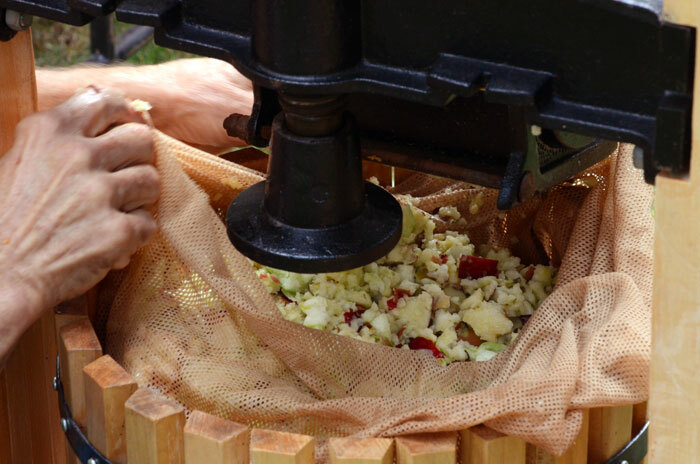 The crushed apples are then pressed to expel the juice. As fresh as you can get! The pressed-out apple mush piles up quickly, though the volume is far less than the apples we started with… we’ll add some to the compost, and give some to the chickens. 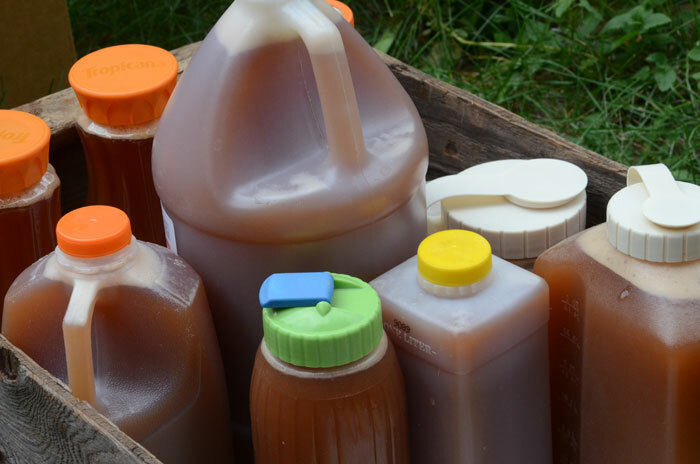 The juice goes into clean jugs; Paula and Eric make delicious hard cider with most of theirs. We’ll make some cyser (cider mead) and freeze the rest for later. Left: the hand-cranked crusher. Right: the leftovers. When we finish, Paula conjures up a fabulous lunch, complete with toasted homemade bread spread with homemade cheese and topped with dried cherry tomatoes. (Somehow, I neglected to take a photo of that!) We raise glasses of bubbly apple-pomegranate cider toast a good day’s work, and good friends, and all the bounty of Fall. Cheers! So many pears! 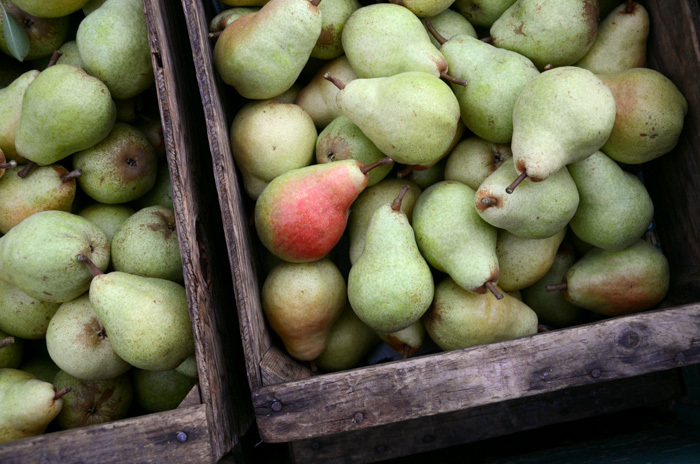 This is the time of year when we pick pears, carry pears, polish pears, sort pears, pack pears, sell pears, dry pears, eat pears…. every single day. It’s a short season, though — just about a month, really — so by the time you’re feeling slightly tired of pears, it’s almost time to start missing them. And that, to me, is precisely the joy of seasonal eating: nothing gets old. And everything, every bite, is wonderful. Which brings me to today’s recipe. 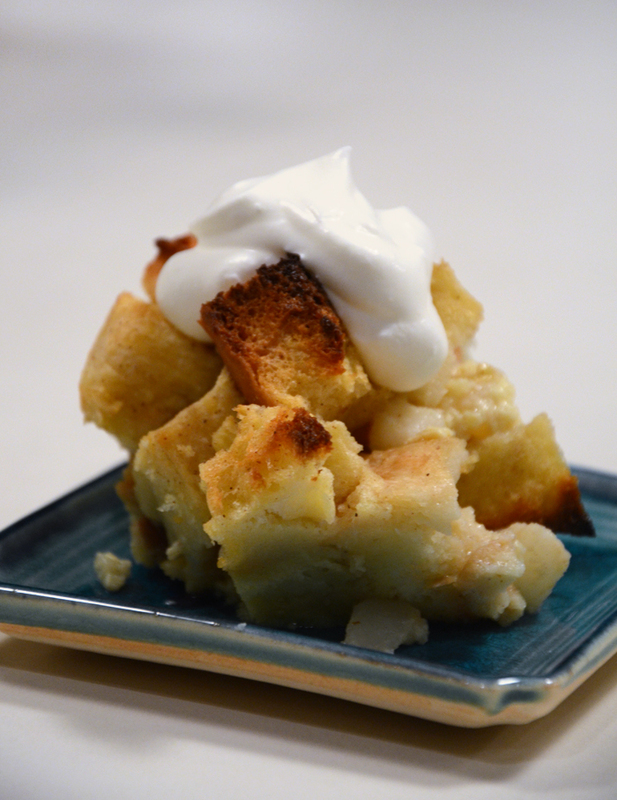 As soon as the weather begins to cool ever so slightly, it’s time to make my favourite brandied pear bread pudding — simple and cozy and delicious, the kind of recipe where every ingredient shines in its own right. Needless to say, it starts with good ingredients: a dense, crusty loaf of country-style French bread, or a rich challah; perfectly ripe pears; whole milk and fresh eggs for the custard; and, if you are lucky enough to have some in your pantry, pear brandy. We’ll get to the recipe in a moment, but first, about that brandy…. We always get a kick out of bringing one of these pears-in-a-bottle to the farmer’s market and setting it somewhere on our table. It never fails to set people to talking — and to tossing around all kinds of wild speculations on just how that pear got in there. “Did you light a match in the bottle, like with an egg?” “I know, you put a pear seed inside!” Of course, the real explanation is quite simple…. any guesses? 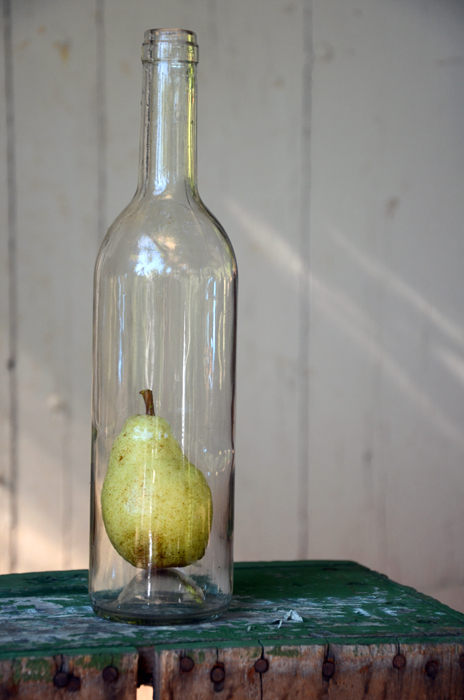 Growing a pear in a bottle (shhhh, it’s a secret!) is amusing enough on its own, but the real fun starts when the pear is ripe, and you fill up the bottle with brandy. The sugars and flavour of the fruit infuse the alcohol; we let the bottles sit for a good 6 months before opening them. 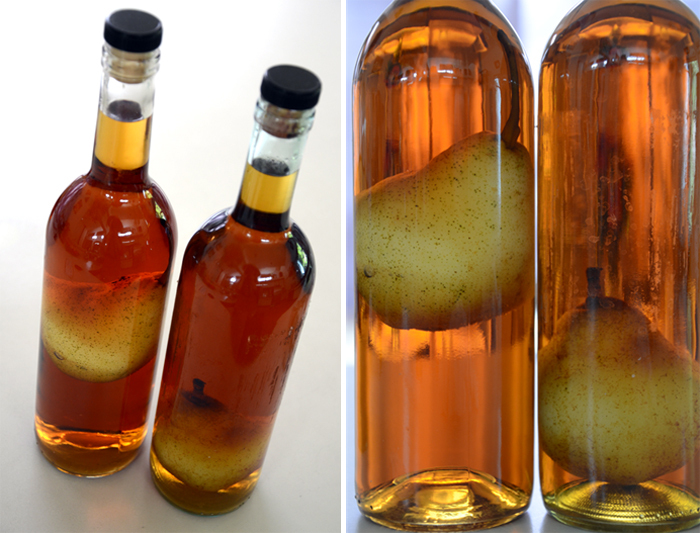 Pear brandy makes a lovely after-dinner drink, and it’s a sublime baking ingredient. You can make a just-as-good, if not quite so spectacular, version by setting a ripe pear in a mason jar and topping it off with brandy. For this recipe, you can use regular brandy if you don’t have pear brandy ready-made, or even omit the brandy altogether. 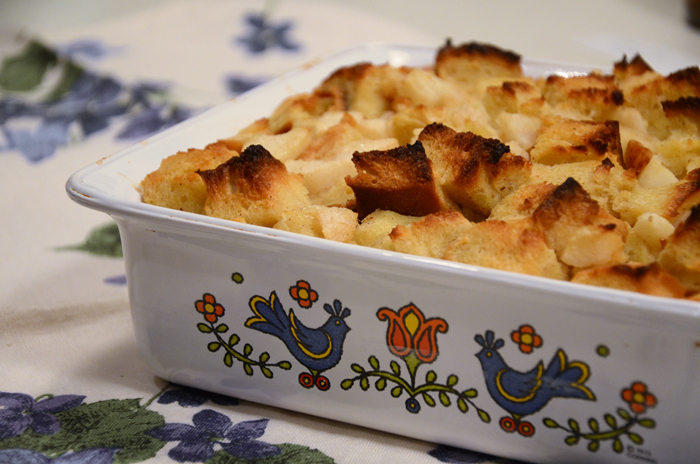 It lends a subtle and compelling warmth to the pudding, and the smell as it bakes is absolutely divine. I highly recommend the leftovers (should there be any) for breakfast! …and a deep 9″ square baking dish. Preheat oven to 350°. Peel, core, quarter, and slice the pears into bite-size pieces. 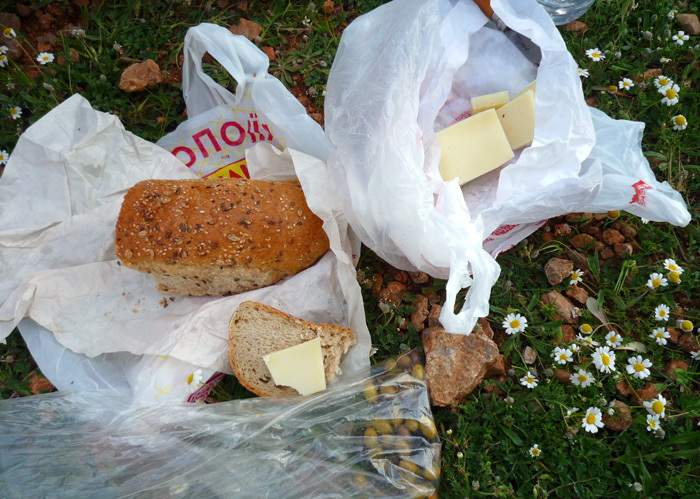 Slice the crusts off the bread and cut the bread into 1-inch cubes. 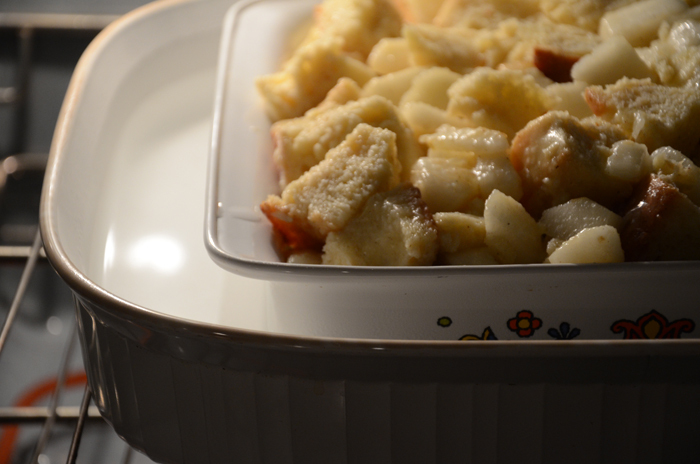 Put the pears and bread into a large bowl and toss to mix. Whisk milk, eggs, sugar, brandy, vanilla, and spices in a medium bowl. Slowly whisk in the butter. Pour this over the bread and pears in the other bowl, gently stir/fold to coat everything evenly, and let stand for 20-30 minutes, or until most of the liquid is absorbed. Turn the mixture after 10 to 15 minutes, being careful not to over-mix; you want the bread pieces to remain as intact as possible. You may need to tent the pudding with foil if it looks like it is browning too quickly — if so, remove the foil for the last 10 minutes or so of baking so the top gets nicely crisp. Serve with lightly-sweetened whipped cream (with an additional dash of pear brandy mixed in, if you like) or vanilla ice cream. Enjoy! It’s pouring rain today, but that won’t stop me from posting ice cream recipes! 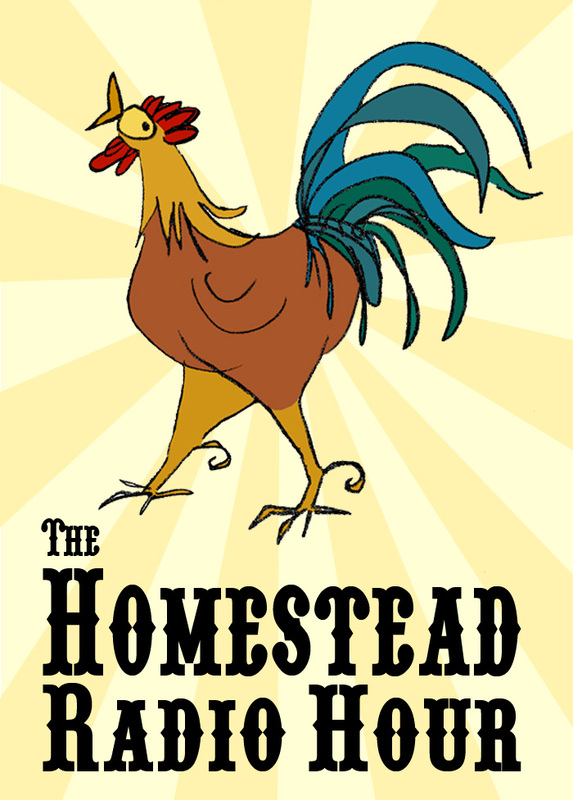 It has finally been acting like a proper summer here in the foothills… until today, that is, when we had a spectacular all-afternoon downpour that sent the chickens running for shelter and completely flooded the new duck pond I’d just finished building this morning (more on that later!) Of course, the rain is great for the seeds I planted, at long last, in my flower garden; and, really, it does cool things off ever so nicely. That’s the only catch: It no longer feels quite so much like ice cream weather — but in a few days things will heat up again, no doubt, and that’s where this recipe comes in! So: my favourite new ice cream recipe, I think. Which is saying something, as I love love love making ice cream. My sweetheart gave me a super-duper electric ice cream maker a couple years ago for my birthday — boy, does he know me! — and I’ve been fascinated with the making of frosty confections ever since. Electric ice cream makers are genius, by the way; the old-fashioned hand cranked model has its nostalgic charms, sure, but how often do you actually feel like using the thing? Maybe once a summer? Fast forward to the ‘lectric version — just switch it on, toss in your ingredients, and let it do the rest. Et voilá: homemade ice cream whenever you like! On a whim! Got some extra strawberries? You know what to do! Now, once you’re set up with your nifty machine, it can be tempting to go a little crazy with the ice cream thing. So many possibilities! But after a few rich, cream-heavy, custard based concoctions and complicated all-day recipes, you might be looking for something a little lighter — and simpler. How simple? Well, if you happen to have some lemon curd on hand, it’s just a matter of stirring together three ingredients and switching on the machine. No lemon curd? Don’t despair — it’s easy to make, and you can always buy a jar in a pinch…. but, if you have the time, absolutely do try making some from scratch! The recipe here comes straight from my dear friend Thea, who hails from the Magical Land of Lemons and Citrus, a.k.a. Penryn, California (a few short miles down the road from us, and a few very crucial degrees warmer in climate.) It’s absolutely heavenly folded together with whipped cream and dolloped on angel-food cake or with fresh berries, so by all means, do make extra. As Thea says, it lasts refrigerated for about a week — but it’s unlikely that you’ll be able to keep everyone away from it for that long! So, on to the recipes! The frozen yogurt is super simple and so addictive — it’s perfect for the summer party when you want to make something dressy for dessert but don’t want to turn on the oven or spend all day on it. And to top it off, it’s yogurt, after all; you could argue that it’s quite healthy. What are you waiting for? Whip up a batch and dig in! The measurements for this recipe are all pretty loose; no need to get out the measuring cups if you can eyeball an approximate 2/3 cup of lemon curd. I haven’t yet tried it with low- or non-fat yogurt, but I suspect it would work well with those, too. I do wish I had a better photo here, but as you can see, the ice cream was almost gone by the time I got out my camera! Scrape the ice cream out of the machine into a chilled bowl or container. Cover tightly and freeze for at least a couple hours before serving. 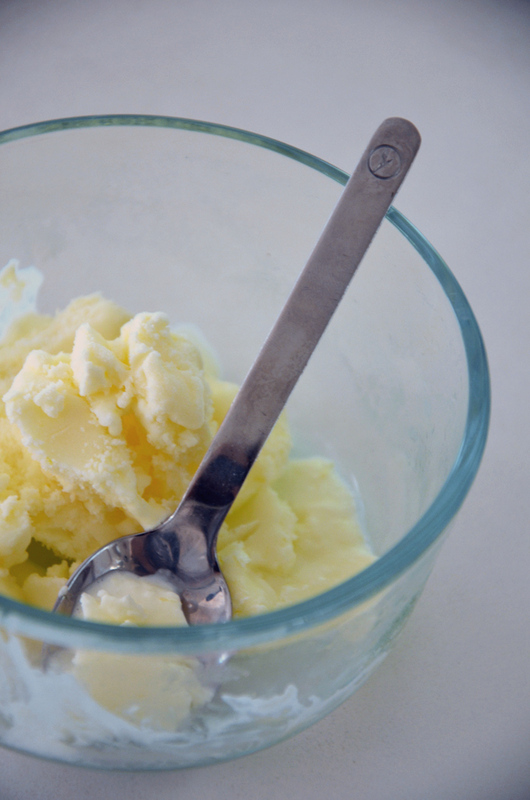 For the best scoopability, remove the ice cream from the freezer a few minutes before serving. It’s lovely on its own, but if you’d like to gild the lily a bit, add a sprinkling of fresh blueberries, drizzle with honey and garnish with a sprig of rosemary. A very rich, tangy, egg-thickened custard great on toast, as a cake filling, etc. Whisk the egg yolks and sugar together in a small saucepan or the top of a double boiler. 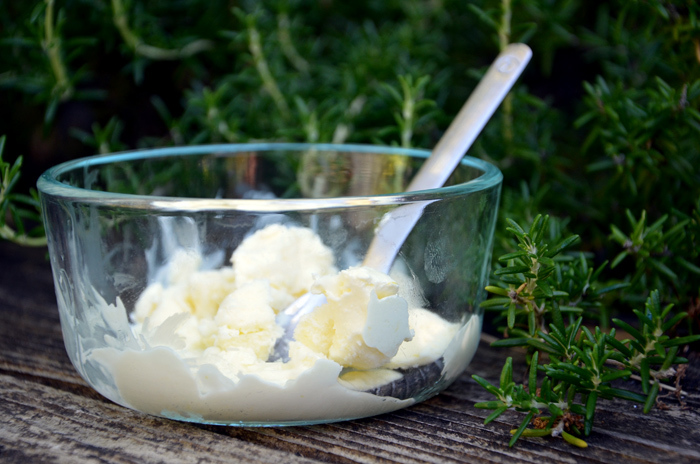 The double boiler takes a little longer, but it’s safer – you’re less likely to overcook the eggs or burn the custard, both of which are easy to do! So, in your vessel of choice, add the lemon juice and butter to the sugar and eggs. Cook it over low heat (if you’re just using a pan, use the lowest possible heat! ), whisking until the butter melts to get everything mixed well. After the butter is melted, I usually switch to a spoon to stir with, since it’s easier to get into the corners. 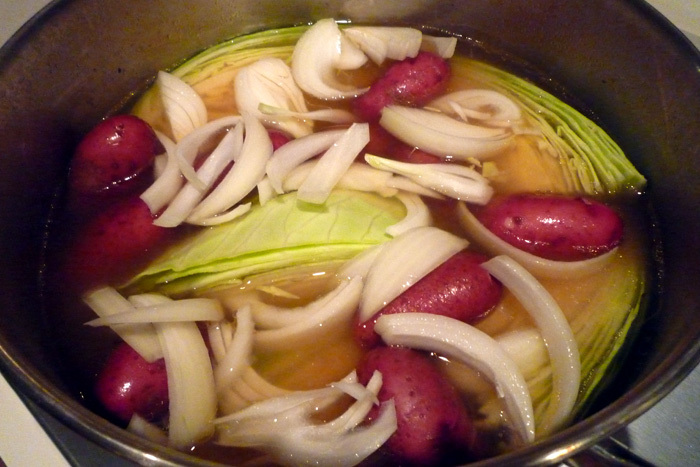 Keep stirring, frequently with a double boiler or constantly with a saucepan. Make sure to scrape the bottom and sides to keep it from sticking. The mixture will be frothy at first, but that will go away as the custard starts to thicken. Cook it until it is thick enough so that when you lift a spoon out of it the back of the spoon stays coated, and you can draw a line through it with your finger that doesn’t go away. You don’t want it to boil at all (keep stirring! ), but it often starts to bubble just about when it’s done. It will thicken more as it cools. You don’t want the custard to be lumpy, which happens if the eggs get overdone. If you see a few lumps, you can pour the curd through a sieve. After that, add the lemon zest. If it’s not sweet enough for you at this point, you can add a little more sugar and stir it in too. Let it cool in a bowl with waxed paper or greased parchment sitting directly on the surface of the curd – this keeps it from forming a skin. Some people use plastic wrap instead. Keep it in a jar in the fridge – it keeps for about a week, but it doesn’t usually stay around that long in my house! Thanks, Thea, for the fabulous recipe! What are they? Favas! Or Koukiá, as we call them in Greek. A remarkable-yet-remarkably-underappreciated bean. 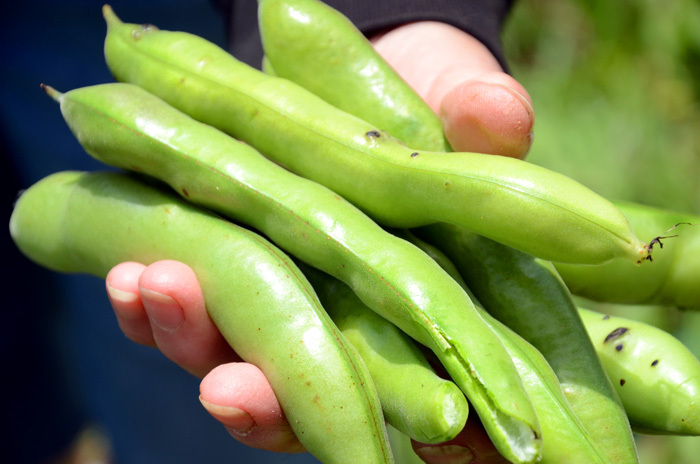 They are very easy to grow, they’re one of the first springtime vegetables, and they’re delicious — and yet, it does take some searching to find fava beans. I’ve seen them a few times in the grocery store (usually in very small quantity), but by and large, if you want to get your hands on some of these tasty legumes, you’ll have to grow them yourself or go to the farmer’s market. Life is hard, huh? And as much as I love, love, love the farmer’s market — our local markets are fantastic — I’m all for the backyard plot on this one! 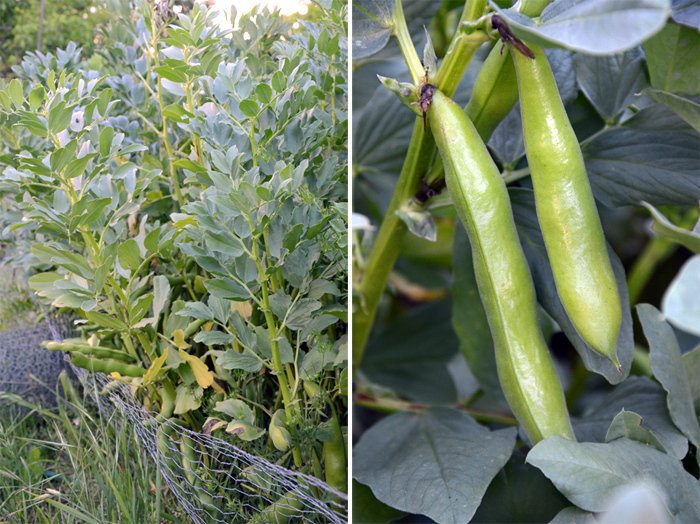 Not only are favas simple to grow, they also have lovely sweetpea-scented flowers and, being a legume, they’re great for the soil. 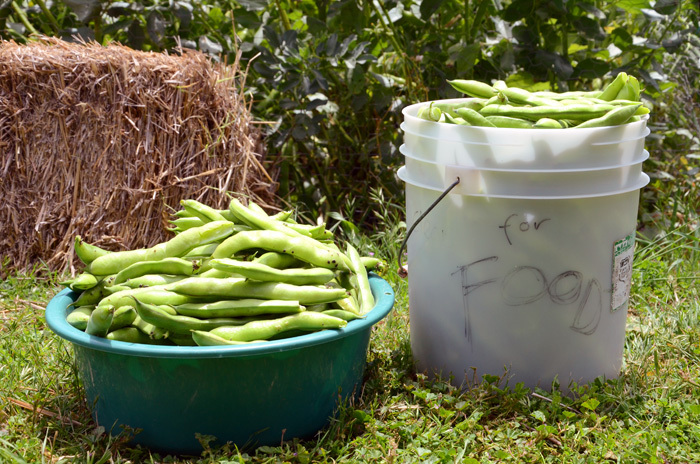 You can even grow them (or their cousin, bell bean) as a cover crop; just be sure to cut and compost or till them in before they start to bloom for the highest nutrient level. See, they’re just such happy-looking plants! We plant the seeds in the fall, usually November or thereabouts, when the rains begin but it isn’t yet too chilly out. They grow all winter long, getting taller and taller — by harvest time, the topmost leaves (which, incidentally, are edible and tasty when young) are brushing my shoulders. We plant them in a block and fence the plot on all sides with chicken wire, about two feet high; it keeps hungry critters like rabbits away from the young sprouts, and when the plants get taller, it provides just enough support to keep them from falling over. Which they absolutely will, if you let them. They’re also abundant producers. Our fava patch this year was about 6 by 8 feet, and we ended up with a tremendous harvest — I’m guessing 20 to 25 gallons of beans in the shell. 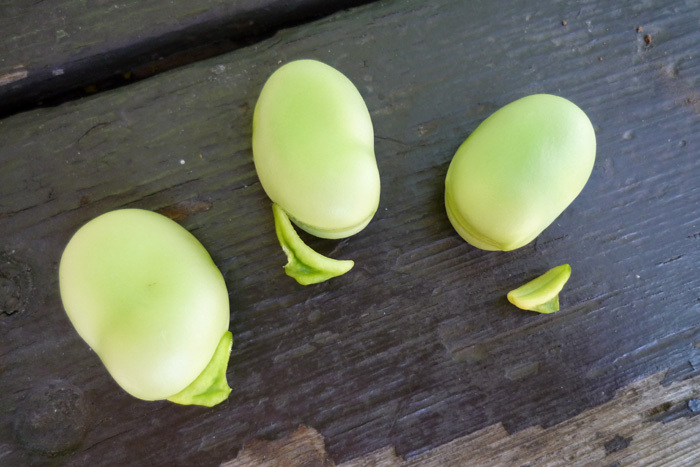 Of course, there is one catch with fava beans: they’re mostly shell! 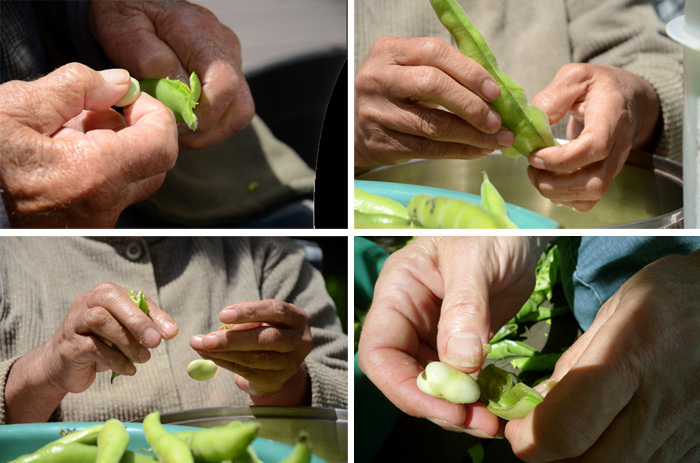 The beans themselves are wrapped in a tough, spongy-textured pod, and it can take quite a lot of time to shell them if you don’t have help… so, like many things of this nature, it’s really best as a communal activity! 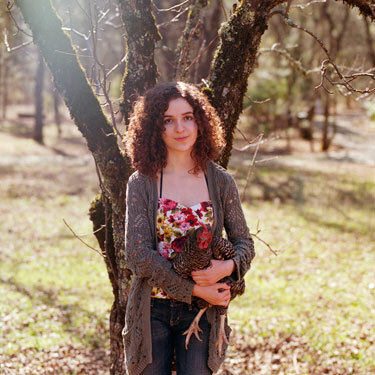 Round up a few friends and make some lemonade — you’ll find it’s quite pleasant work that way. Annnnd, the final bean-to-shell ratio. 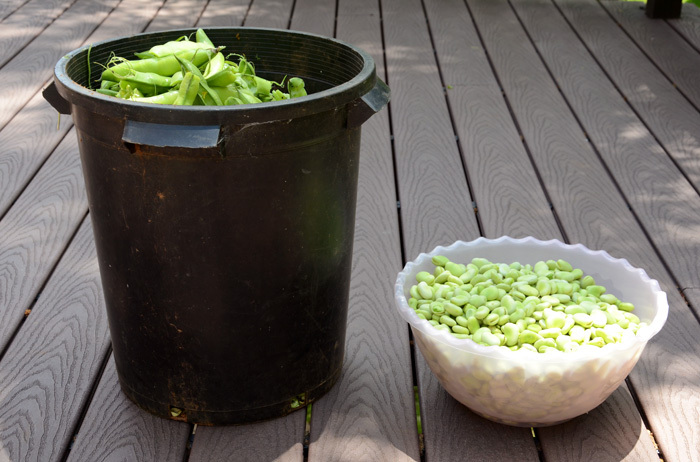 Take heart — those empty pods will do wonders for your compost pile! 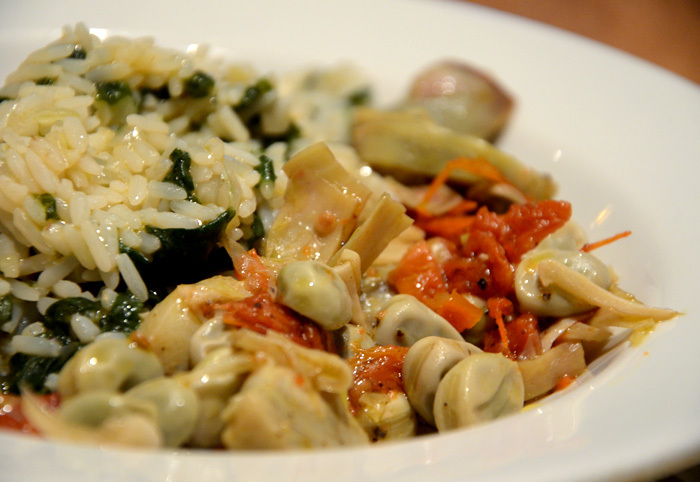 Ragout of fresh favas with artichokes from Bob Roan and Teri Ueki, with our own dried tomatoes and spanakorizo (rice with spinach, Greek-style) …. mmm-mmm! Making Things: The Best Homemade Corned Beef Ever! I’m a little bit obsessed with making things. Food things in particular. Especially the ones that we’re all used to buying from the grocery store. Bacon, olives, cheese, soda pop, marshmallows — they just turn up on the shelf, in jars and cans and packages, and that’s that — right? Well, of course not; if you’ve ever planted a garden or cooked a meal you’re aware of that. Most of us (I hope) are. But what we are so often unaware of is the process that goes into making these things. And that’s what I’ve gotten hopelessly hooked on: the process. When you start making things like cheese or sauerkraut or olives, you become immediately, profoundly aware that these foods weren’t developed simply because they are tasty or go well with a sandwich: They grew out of the age-old need to preserve seasonal foods for the rest of the year. That became particularly clear to me the first time I made a batch of cheese — I had never really thought of milk as a seasonal food, like strawberries or tomatoes, but it most certainly is. Hence, cheese. 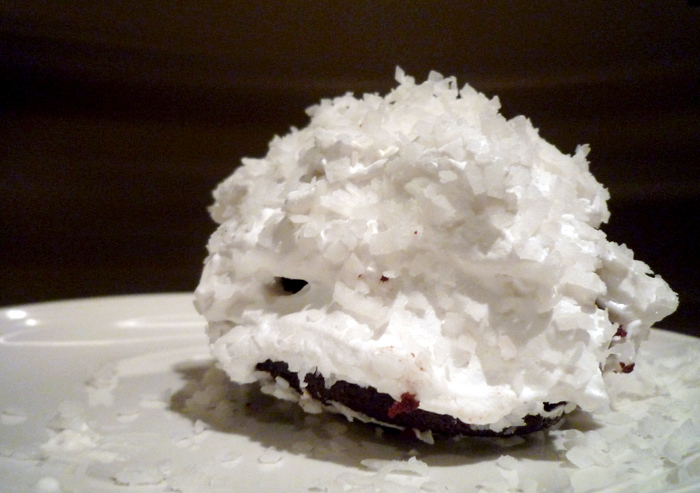 homemade sno-balls: worth the work? …yes. definitely. Winter is a lovely time to dip one’s toes in the waters of Making Things — sweet cabbages abound at the farmer’s market for sauerkraut, citrus galore for lemon curd and candied peel, and the cold, wet weather make indoor projects all the more appealing. My current fixation: Corned Beef! I made my first home-cured corned beef last year, and it looks to be becoming a new tradition around here. What with the horror stories surrounding “mystery beef” and the toxic qualities of nitrate/nitrite, store-bought corned beef looked to be a thing of the past at our St. Patrick’s Day table — and I couldn’t have that! So, what to do? We checked out the pricey cuts at nearby natural-foods markets, but that seemed to be a bit much for what we thought of, up til then, as a bit of a novelty meal. I consulted a few cookbooks, found several recipes for home-made corned beef, and decided to give it at try. We went to our local butcher shop, picked out a nice beef brisket, and proceeded with the recipe. 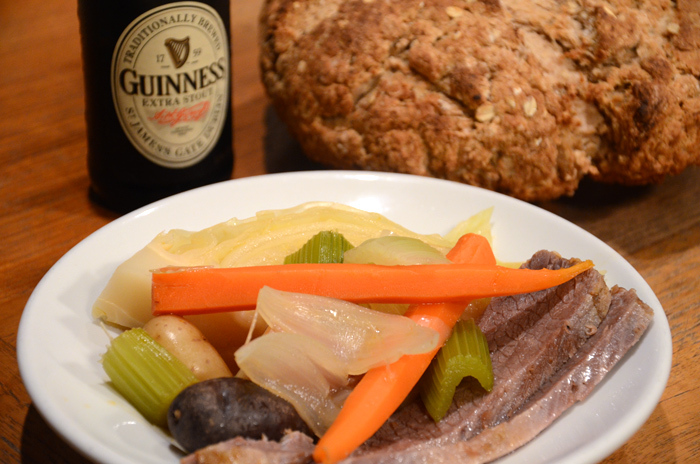 Five days later, bam — the best corned beef we had ever tasted! Fantastically flavorful, not too salty, spiced just so. A world apart from the store-bought stuff. We raved about it for days. And the best part is: it’s surprisingly simple to make! A dry-rub of salt and spices is less messy than the usual pot-of-brine method, you only need to check on it once every day or two, and the ingredients (other than the meat) are likely things you have in your pantry already. This post is a bit late this year to have it ready for St. Patrick’s, but don’t let that stop you — it’s fantastic any day! Why “corned?” The name apparently derives from Old English: “corns” of coarse salt were originally used to preserve the meat. We’re using kosher salt, but otherwise, the method here is more or less the same as the one used hundreds — even thousands — of years ago. Many recipes, as well as most commercial corned beef products, contain saltpeter (potassium nitrate) as a preservative and colour enhancer. This is what gives store-bought corned beef its bright pink hue, but it’s really not necessary — and a Google search will reveal hundreds of articles on the detrimental health effects of nitrates in processed foods. (Besides, saltpeter isn’t exactly something you can just pick up at your average grocery store, and it’s an ingredient in gunpowder! Yum, right?) The good news is that you can make perfectly fine corned beef without it, as we’re doing here. If you are lucky enough to have a local butcher shop, by all means buy your beef there! We used a lovely brisket from Longhorn Meats here in Auburn — they even cut it to order for us. Ask the butcher to trim off most of the fat, or trim it yourself before you get started. The salt curing tenderizes tough-yet-flavorful cuts, such as brisket; and, of course, it bears mentioning that if you’re going to put in the time and effort on a project like this, it’s worthwhile to start out with the very best ingredients you can find! 1. 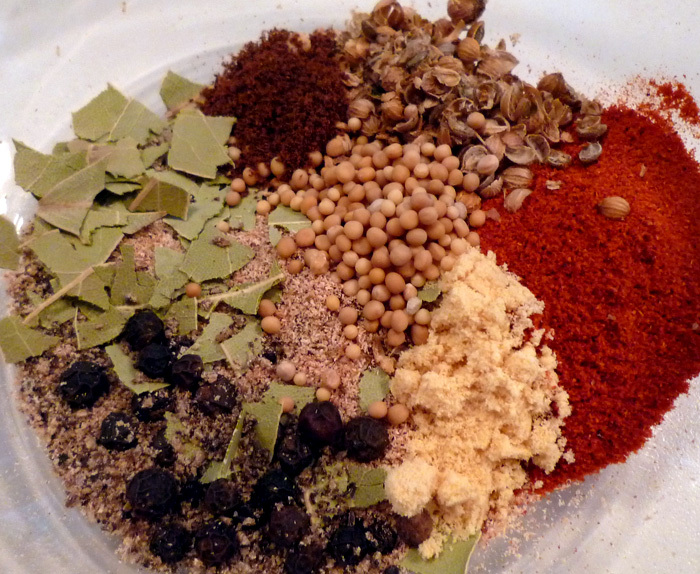 Combine all spices with the kosher salt in a small bowl. 2. Lay the brisket on a baking sheet, cutting board, or other work surface. With the bamboo skewer, poke holes all over the brisket, about an inch apart, clear through the piece of meat. Turn brisket and repeat on other side. 3. 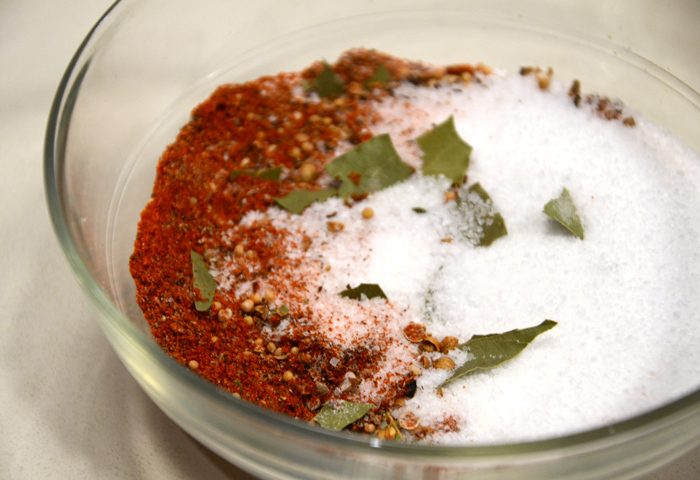 Sprinkle a handful of the salt rub over the brisket, and rub in thoroughly. You’ll want to sort of “massage” the salt into the meat with your fingertips. Repeat until both sides of the brisket are evenly coated, and all the salt mixture has been used. 4. 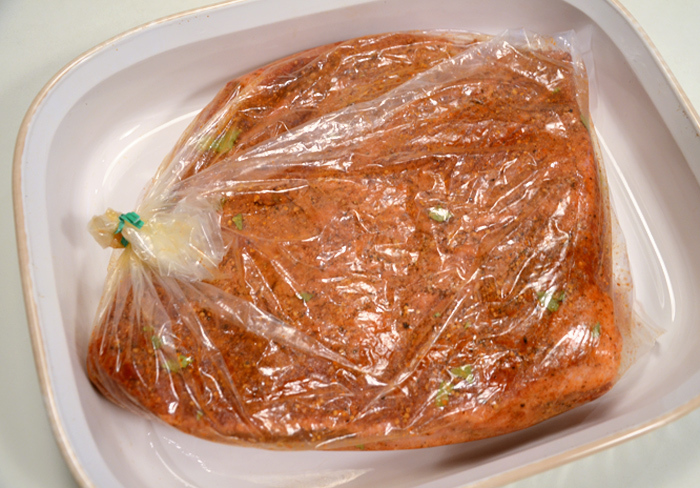 Place the brisket in the plastic bag — you might need an extra set of hands to do this — and seal the bag, squeezing out most of the excess air. Place the bagged brisket in the baking dish. 5. Now, just park the dish in the refrigerator — and don’t forget about it! The salt will draw the juices out of the meat; turn the brisket every day or two so both sides spend equal time in the juices. We leave ours to cure for about five days. If your brisket is particularly thick, say two inches or more, you might want to give it an extra day or two. When you are ready to cook the corned beef, remove it from the bag and soak in cold water for a couple of hours, changing the water once or twice. This helps to draw out the excess salt. 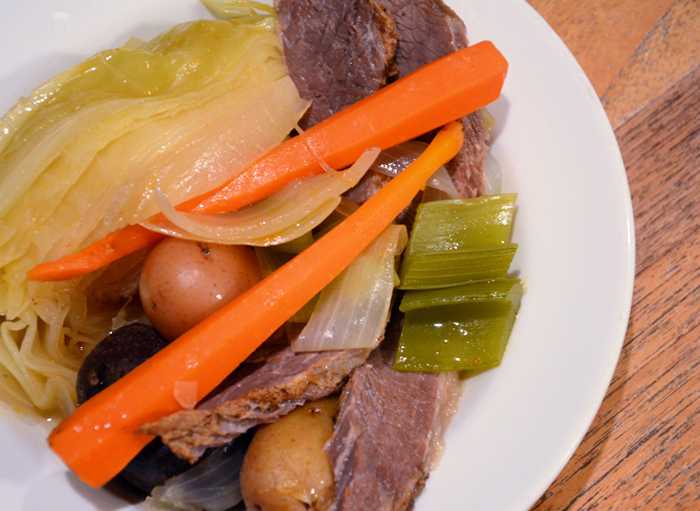 You can now proceed with your favorite corned-beef-and-cabbage recipe — the farmer’s market is a great place to pick up the requisite carrots, onions, and potatoes. 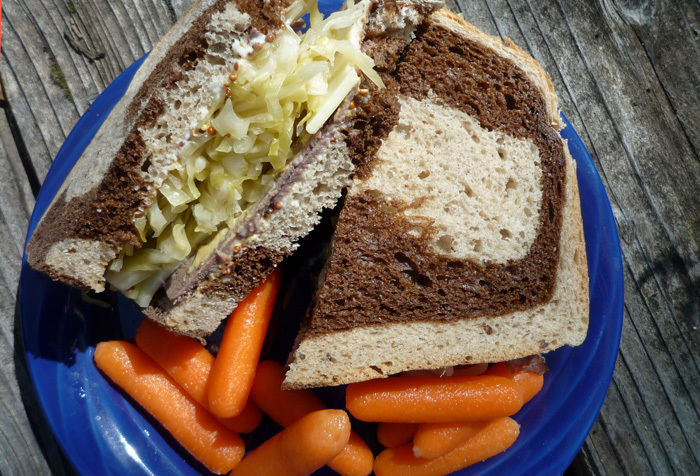 And the leftovers make a sublime sandwich — especially when paired with local marble rye and homemade sauerkraut! 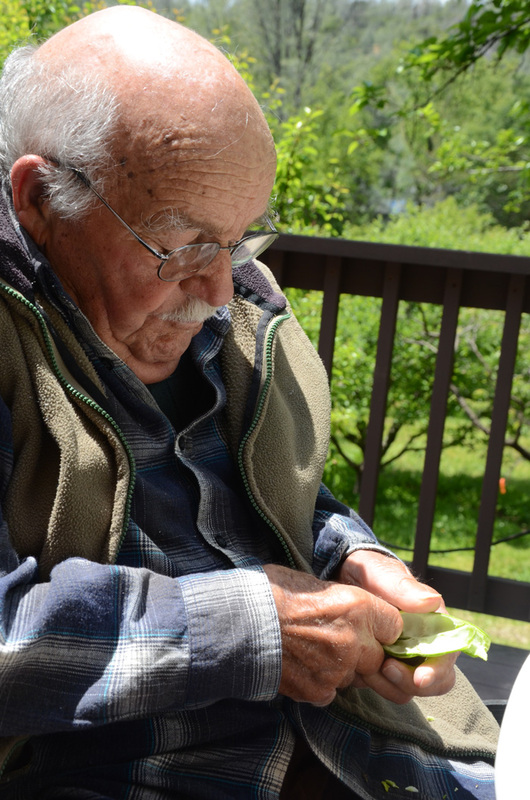 Being Greek, our family has made olives for generations. I have vivid memories of sitting in the wine cellar on chilly winter evenings, dunking into Papu’s gigantic ceramic crock with a long-handled ladle; fishing out briny, bright-green and scrumptious homemade olives, and (occasionally) eating so many as to spoil my appetite for dinner. Water-cured olives (see previous post) are a bit simpler to make, but lye-cured olives have a particularly rich, almost buttery flavor that make them well worth the extra effort. 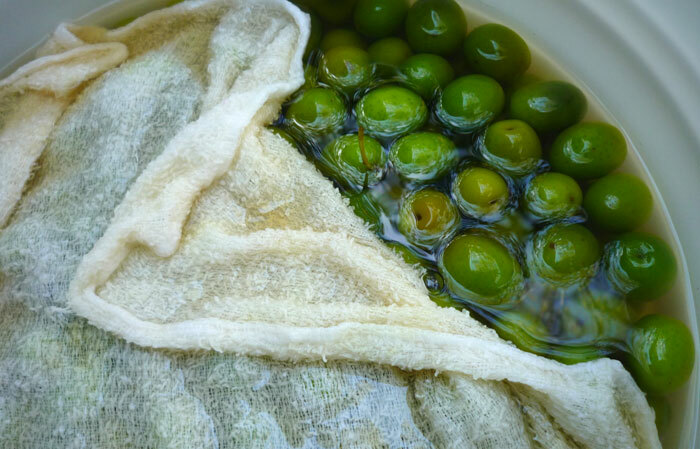 And, really, it’s a much shorter process than the weeks of soaking-and-draining necessary for water-curing; you’ll just need to set aside a day or so when you can tend your olives every few hours. In the olden days, everyone around here would use Lewis Lye for making olives. 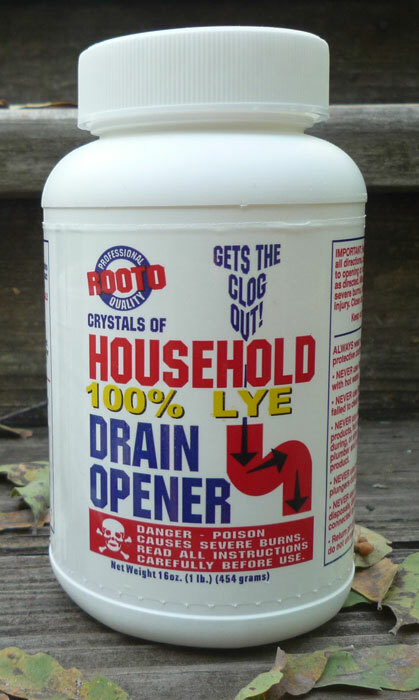 Nowadays — at our local hardware store, anyhow — our friend Lewis has been replaced by a product with the rather alarming name of “Rooto.” It’s sold as a drain cleaner, and costs three or four dollars a bottle (plenty for several batches of olives.) Just make sure whatever kind you buy clearly specifies “100% Lye” or “sodium hydroxide” on the label. If it doesn’t, or if there are any other ingredients in the product, don’t buy it; go to another store and try again. Look for lye in crystal form — liquid or flakes may measure differently and throw off the recipe. You’ll need mature green olives for this recipe. 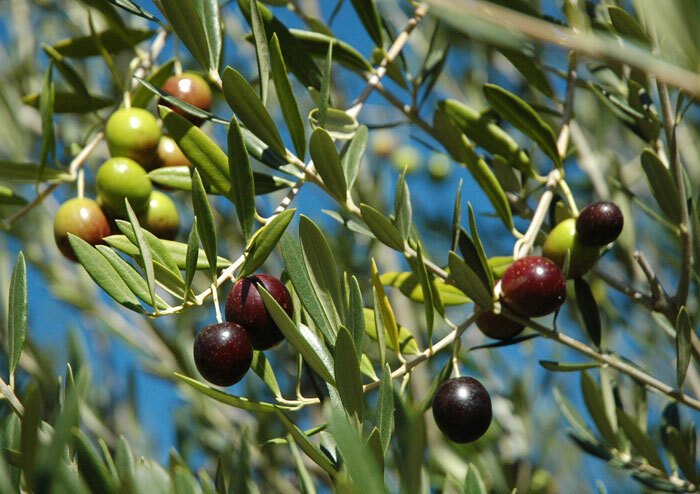 To make sure olives are ready to be picked, give one a squeeze; a milky white juice should show. A tree will usually have olives of various stages of ripeness on the same branch, so if there are some red or black fruits on the tree, their greener neighbours are probably mature enough to be picked. Olive trees are often planted for their looks; these are the trees that spangle the sidewalk with smashed purple fruits come autumn. The next time you spot an olive tree heavy with fruit, ask its owners if you might pick a bucket or two — chances are, they would be only too thrilled if you would please take the entire crop, far, far away, and do with them whatever you like, just get those foul little things out of our yard… so, of course you must now call all your friends and have yourselves an olive-making party! That gigantic olive crock has gotten a little too cracked and pitted from so many years of lye and salt (not to mention age itself), so this year I’m using a five-gallon food-grade plastic bucket instead… it works just as well, even if it isn’t quite so nice, and will do the trick until I can find another crock (ideas, anyone?) Whatever your container, fill it about half full of olives — in this case, about 2 1/2 gallons of fruit. Rinse and drain the olives; place them in the bucket you want to make them in. Pour 2 1/4 gallons cold water into your mixing bucket, and sprinkle the lye over the surface. Use the long-handled spoon to mix well, being careful not to splash. The lye will sink to the bottom and form a crust; be sure to scrape this up and dissolve it thoroughly into the water. 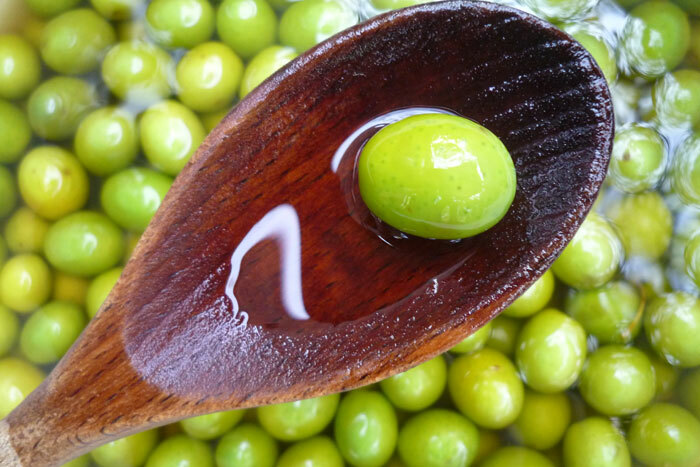 The lye will heat the water as it dissolves; if you start with very cold water, it won’t be too warm for the olives (you don’t want to cook them.) If the outside of the bucket feels warm, check the temperature — it’s OK if the mixture is below 70°. Otherwise, allow it to cool before proceeding. Pour the lye solution over the olives and stir. If you have extra lye solution left, pour it down a household drain — never near plants or down a storm drain. After about four hours, fish out one of the olives with your spoon, rinse it well, and slice it open to the pit. You’ll notice a ring of yellow-green flesh around the outside, while the inside will be a creamy white. The yellow area is where the lye has penetrated, while the white has not yet been reached — eventually, you want the entire inside to be yellow. Check a couple olives again after six hours, and continue to check every hour after that. The yellow areas will darken to brown with air exposure, making it easier to see how deeply the lye has penetrated. The olive on the left has been in the solution for four hours, while the one on the far right is almost finished, after nine hours. This batch of olives took about 9 1/2 hours total to soak; when the olives start to sink, instead of float, you’ll know they are almost done. As soon as the olives are completely yellow inside — check three or four of different sizes — carefully pour off the lye solution, wearing rubber gloves. (We covered the top of the bucket with a large colander and inverted the entire thing.) Rinse several times with clean water, until the water is no longer brownish. Now that the lye has leached the bitterness out of the olives, you’ll need to leach out the lye. This can take several days to a week, depending on your method and the size of the olives. We stick a garden hose all the way to the bottom of the bucket, set it on a slow trickle, and place the bucket lid or a piece of wood ajar on top to keep out leaves and curious critters. If you don’t want to leave your water running, you could also just fill the bucket with water and then change the water several times a day; this method may take a bit longer. Either way, give them a stir once in a while, and slice into an olive occasionally after a day or so to see if it still feels soapy or slippery inside.